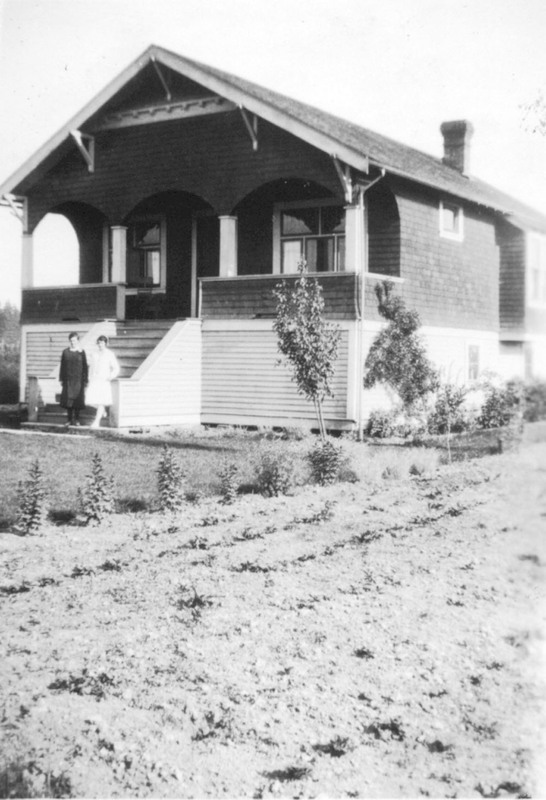 Brown family home on their Haney property south of Dewdney Trunk Road and east of Ontario Street in the mid-1920’s. Dugald Brown, born 1877 on the island of Ѐisdeal (Easdale) in the county of Argyll, Scotland, was the youngest of ten children. He had been working as a ship’s carpenter when he and his brother Donald decided to emigrate, arriving in Winnipeg in 1904. Before leaving Scotland, he had become engaged to Jessie Rowan. She joined him in 1905 and they were married in Winnipeg. They moved to Vancouver in 1911 where Dugald worked as a house builder. He also worked in Victoria and moved back and forth between the two cities until 1919 when he moved to Haney. In 1920, Dugald bought 5 acres of land from Daniel Haney. That land includes all the land between what is now the Memorial Peace Park and Dewdney and between 224th and the new municipal office complex. 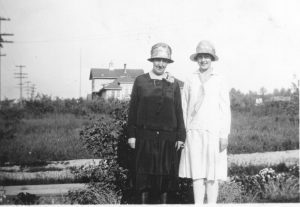 Dugald built a fine house on the property for his family that was located just east of Ontario Street on the south side of Dewdney Trunk Road, roughly where the library once occupied the Mager block. Dugald worked extensively as a builder in Haney. Not only did he build his own house, he also built a row of stores along Ontario Street [224th Street], some of which are still standing. He also won a number of municipal contracts to work on schools, including Haney Central, Alexander Robinson and Hammond, as well as contracting work on the Aggie Hall, the Masonic Hall, and the Pitt Meadows Municipal Hall which is now the Community Hall on Harris Road. Jessie (L) and Beth Brown stand at the front of their home (not pictured) on Dewdney Trunk Road in 1927. MacLean High School is visible in the background. Jessie died in February, 1933 after an illness. Her funeral took place at St. Andrew’s Church where she had been a devoted volunteer. At the time Dugald Brown was serving as a municipal councillor. Tragedy struck again when their home on Dewdney burned down, in July. He then went back to Scotland for a few years, returning to Haney in 1937 where he was active in building until 1939, spending the war years ship-building in Vancouver. In the 1950s, Dugald moved permanently back to Vancouver where he continued to buy, renovate, and re-sell older homes until he passed away in 1961. Dugald and Jessie had two children, Elizabeth (Beth) and Ian. Ian was born in Victoria, but lived in Haney from 1919. He helped his father in his work while still in high school and then studied mechanical engineering in Scotland during the 1930s, when he and his father returned to the country. Beth was a teacher at Haney Central School before marrying George Mussallem in 1934, remaining in the community throughout the 1930s.